Where is the Garden State Parkway Interchange 145 Project located? The Project limits are located between GSP Milepost 144 and 152. The main component of the project is in East Orange, New Jersey. Other sections of the work include either bridges over or under the GSP and are located in Irvington, Newark, Bloomfield and Nutley. Why is the Garden State Parkway Interchange 145 Project needed? The Project will improve the safety and operations of the interchange. The high volumes of traffic utilizing the interchange, along with narrow lane widths, poor sight distance and substandard acceleration lane lengths and narrow deceleration lanes, has led to poor levels of service and high accident rates in this section on the GSP. How will the Garden State Parkway Interchange 145 Project reduce traffic congestion? Congestion will be reduced by widening Ramp SBE (Interchange 145 Toll Plaza to GSP Southbound mainline) to provide a two-lane entrance ramp. The existing Ramp SBE narrows from five lanes at the Interchange 145 Toll Plaza to a single lane entrance ramp. Providing a two-lane entrance ramp will improve the operations of the ramp merging onto the GSP Southbound mainline. The GSP Northbound will be widened to re-establish the two-lane deceleration lane to Ramp NBX (GSP Northbound mainline to Interchange 145 Toll Plaza). What will the Garden State Parkway Interchange 145 Project improvements include? Reconstruct the pavement along Oraton Parkway Northbound and Southbound from Central Avenue to Park Street. Upgrade idewalks within project limits to meet the requirements of the Americans with Disabilities Act (ADA). Structural repairs and other improvements to GSP Bridges at Clinton and Springfield Avenues, at 14th Avenue and at South Orange Avenue. Bridge deck replacement on GSP Bridges at Montgomery Street and at East Passiac Ave. When will construction for the Garden State Parkway Interchange 145 Project take place? Project construction is scheduled begin in June 2018 and conclude in 2022.
Who is providing funding for the Garden State Parkway Interchange 145 Project? Funds for the project are provided by the New Jersey Turnpike Authority. What if I have a question, comment or concern regarding the Garden State Parkway Interchange 145 Project? Questions or comments can be submitted through the form on www.GSPexit145.com or via the project hotline at 1-800-374-5137. As part of the environmental impact statement that the New Jersey Turnpike Authority prepared for this project, they performed a noise wall study and analysis. That analysis was performed to determine whether the need for a noise wall was warranted in accordance with the criteria established and universally applied by the Authority on all their projects. The result of that analysis was that noise walls associated with this project were not warranted and therefore no noise wall was designed or included in this project. The Authority, in response to the community, has agreed to provide the noise wall study and analysis to the City of East Orange for their review. Will there be police presence to protect children on the way to school? AECOM and George Harms Construction will be working with the City of East Orange to determine the need for police protection at each of the project work zones. Police assistance is typically used while a work crew is operating at a specific work zone. This coordination effort with the City of East Orange has already been established and continues with all scheduled work. Who is checking to make sure that everything is going accordingly? The New Jersey Turnpike Authority has contracted AECOM to provide construction inspection services for the construction work performed by George Harms Construction. Those services include inspecting the work to make sure that it is performed in accordance with the construction contract plans and specifications. Are the traffic lights going to be visible? The project includes both new traffic signals and street lighting improvements in accordance with the established construction plans. Will there be detour signs re-routing traffic? Temporary detours will be required in order to complete some of the contract work. All detours required for the work on the project will have both advance warning signs and route signs that will direct traffic along the various detour route. In addition, prior to the implementation of each detour, advance notice will be provided to the City of East Orange, published on the project website and sent via text messages and email alerts to all residents that signed up to receive project notices. Where necessary, police assistance will be provided to assist in the implementation of these detours. How do you plan to control air particles and noise during construction? 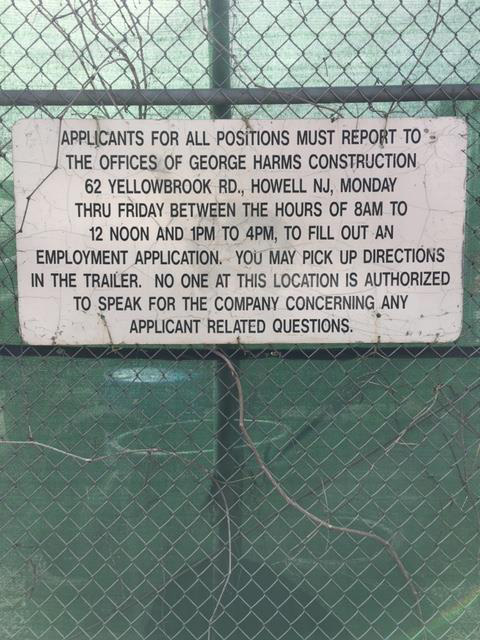 George Harms Construction is required to perform this work in compliance with established noise and air quality standards. AECOM will monitor the contractor’s work for compliance with those requirements. Due to the drilling and removal of old gas/water pipes, is there a chance of the old pipes containing asbestos? If so, can the residents be exposed? When the contractor is performing work operations with known asbestos components, the contractor will be required to perform those operations in conformance with the established protocols to safeguard the public, their work force, Turnpike employees and the AECOM inspection staff. How long will the overall project take and when does it start? Project work began in June 2018 and is scheduled to take 4 years and be completed by the fall of 2022. Will Central Avenue remain open? Central Avenue will remain open throughout the duration of the project, however during construction, the available travel lanes will be reduced from two (2) lanes and turning lanes in each direction to two (2) lanes westbound on Central Avenue and one (1) lane eastbound. Have local residents/contractors been hired for this project? George Harms Construction was selected to perform this work through the Authority’s contract procurement process. That process was a competitive bid process and George Harms Construction was awarded the contract since their proposed cost for the project was lowest cost among qualified contractors that submitted bids. How will the traffic pattern flow upon completion? The traffic pattern on Central Avenue will return to its existing configuration with dedicated left turn lanes. The exit ramp from the southbound Garden State Parkway to Oraton Parkway and into Interchange 145 will be restored. The traffic pattern on the entrance ramp from Interchange 145 to the southbound Garden State Parkway will increase to two (2) lanes that will merge into the southbound main line. The northbound Garden State Parkway exit ramp to Interchange 145 will increase to two (2) lanes. The northbound Garden State Parkway tolls and toll booths at Interchange 145 will be removed and the exit toll eliminated. How will the temporary southbound Garden State Parkway ramp affect the traffic during the year? The temporary exit ramp from the southbound Garden State Parkway to Central Avenue will be used to detour vehicles wanting to head eastbound on Central Avenue toward Newark traffic. Those vehicles that want to head westbound will be able to continue to Central Avenue and make the right turn onto Central Avenue. Has your company worked with African American contractors before and if so, what percent? Are there going to be opportunities for local and minority businesses? The Authority’s contract with George Harms Construction has set a goal of 25% for small business participation (SBE) in the contract work. What is the website for updates on the project? You can visit the project website at www.gspexit145.com. Project updates will be posted every Friday. What building material is the retaining wall going to be made from? The new retaining walls will be made from reinforced concrete. Where are the traffic lights being placed? The new traffic signals will be installed at the exiting signalized intersections including Central Avenue, Freeway Drive, New Street and Williams Street. Interchange 147 is difficult to exit due to vehicles using the exit lane to try to pass traffic, what plans are in place to reduce congestion at Interchange 147? Under this construction contract there are no improvements planned for the Interchange 147 exit. However, the Authority indicated that, based on the concern raised at the July 24th Community forum, they would review the traffic at that exit. Will people coming from southbound Garden State Parkway wanting access to 280 East need to use exit 147 then take local streets to travel towards downtown Newark? The traffic heading toward I-280 East (or west) will still be able to exit at Interchange 145 and travel to downtown Newark.